These are some of the reasons why investing in commercial property is quite a lucrative source of income and an excellent venue for long-term wealth creation. Before making such an investment, however, you must ensure that the property you purchase has some of the hallmarks of premium commercial property. Some of the things that you must consider when choosing a commercial space or plot to buy have been listed below. Location: The commercial property that you choose to invest in must be advantageously located in or near a major commercial hub of the city. It should, additionally, be easily accessible and well connected via roads and highways to all parts of the city and beyond. The location of the property is important because it plays an important role in attracting customers, clients and even employees to a business. Amenities: When purchasing a commercial space, you must make sure that it provides all the necessary amenities that are required for the smooth operation of a business. These facilities include hundred percent power backup, uninterrupted water supply, hi-tech security, adequate electrical points for all the equipment of the business, etc. Space: The property or plot that you buy must be big enough to comfortably accommodate not just the staff of an organization but also all of its equipment, machinery, etc. If you are purchasing retail space, then it must have enough room to display the wares of the shop while also allowing customers to move around and browse the products quite comfortably. Hence, if you have been planning to buy commercial plots in Mohali or spaces in Mohali, Chandigarh or any other major north Indian city, then you should definitely ensure that it has all of the above-mentioned characteristics of good commercial property. 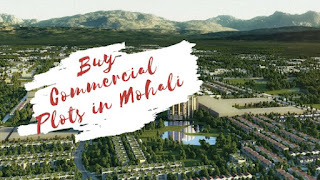 You can contact a reputed property developer in the area to know about the best commercial real estate projects being built in the city of your choice.